Over this past year, I’ve often thought about the craft talk Christine Schutt delivered while I was a student at Washington University. The premise of her talk was something like this: in the first page, sometimes even the first paragraph of a story, there should always be a sentence that gestures toward the heart of its interests. By the end of the story, the author must deepen and darken that sentence so its meaning is transformed completely. It’s an almost mystically elegant idea (always the first page? every story? really? 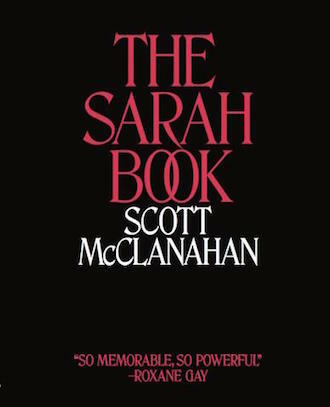 ), but in The Sarah Book by Scott McClanahan, it rings with what feels like truth: between the first page—McClanahan’s dedication not to his ex-wife, Sarah, but “to Julia,” his current wife—the book’s opening paragraph—“There is only one thing I know about life. If you live long enough you start losing things.”—to The Sarah Book’s closing scene—a meeting, years after the divorce, between Sarah and Julia. From the beginning, McClanahan wants us to know that this book is an attempt to give something to Julia, an attempt to share fragments of memory with the knowledge that they will be deepened, darkened, and transformed. From the beginning, The Sarah Book raises a question of its efficacy: What can he contain in a story that’s all about “losing things”? To provide an immediate and obvious answer to this (rhetorical) question, McClanahan’s book contains a collection of moments, sensory textures, and observances that somehow accumulate into the precise fucked feeling of post-divorce existence. He gives us his post-divorce apartment, the slow seeping ssssss of the air mattress leaking, the hole in his blinds cut by a previous tenant to see when the cops were coming. He gives us a bottle of urine, a bottle of Children’s Tylenol, his guts full of garbage food and beer in the Walmart parking lot. He’s all but mastered the art of what I will heretoforth call the poetics of stupid decisions: that sing-songy internal narrator who echoes from the darkest pits of our consciousness, who orchestrates all of life’s most resonant ironies. There’s Sarah’s voice saying “I’m worried about you,” seeming to magically emerge from the creek eek of the piano top where McClanahan hides his booze, seeming to just as magically vanish as the booze renders him “invisible.” He recalls a lie he told his mother in 6th grade when he forgot to throw away the wine bottle he drank from: “It must have evaporated.” And it’s true: our worst mistakes have a way of evaporating, permeating the air with a foggy, amorphous guilt. After burning an old family Bible, McClanahan notices a man at the gas station whose skin looks burned. The fog hovers above him and Sarah as they “[fight] about nothing and [fight] about everything.” The fog starts to weirdly personify itself as McClanahan talks to the chicken wings he’s eating. They have notes that say: There is not another world. There is only this one. Your memories are just the dumb voices inside your head. Love is just biology and the urges of animals to pass on their genes like rats. There are others from grandmothers who say: We just wind up ashes in a stranger’s home. Others from mothers who say: You were always annoying. There is another from your father who writes: Thank god, I’m dead. We were never close. And we never knew one another. Never. The Sarah Book is far more than a letter to Julia, an archiving of Sarah, or an apology for the author’s mistakes (although it is all of these things, an accumulation of so many parts). It is an observance of both collected and collective loss, a nod to all the Sarahs that cannot be contained within this book, but hold it, and read it, nevertheless. The Sarah Book is a loving gesture to the fullness of the emptiness inside of us, a love note to our Christmas presents full of nothing.